As regular readers of my blog, you may now know that I seem to really like the number 3. 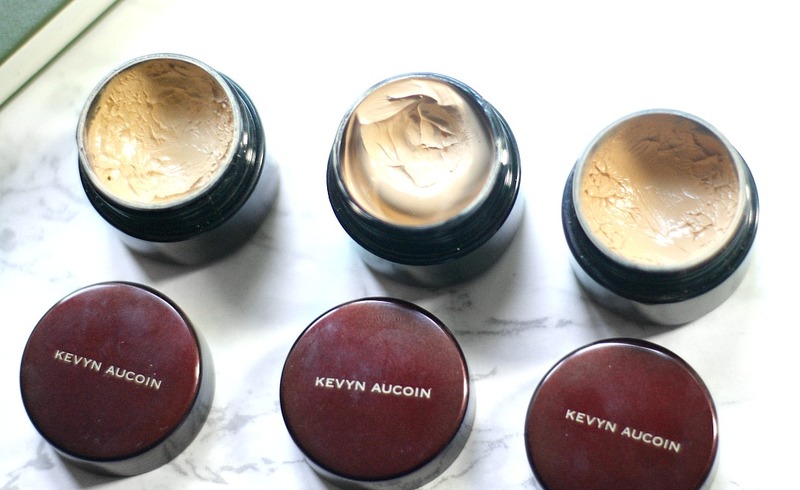 I have my 'Top 3' series and coincidentally I have managed to 'collect' three of the Kevyn Aucoin Sensual Skin Enhancers over the past year and a half. 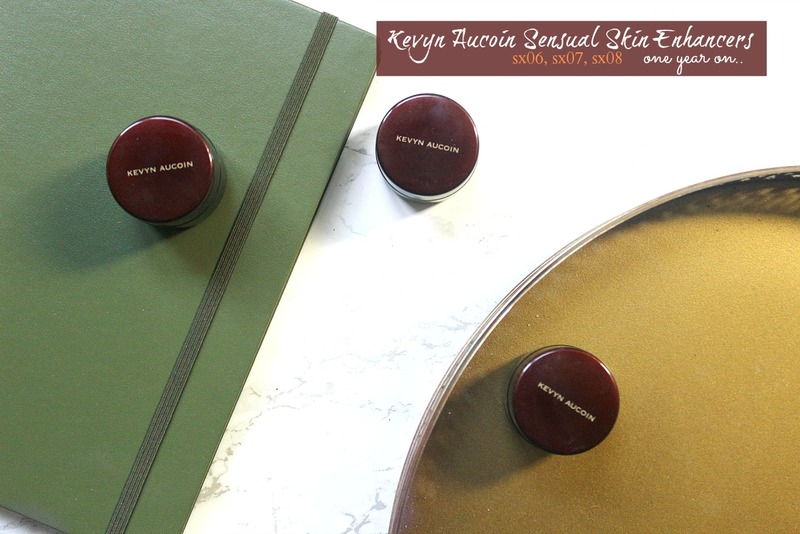 These little pots are quite an investment and they're definitely from the luxury side of makeup, but as you can tell simply by the fact that I have more than one, I love love love the sensual skin enhancer! I wanted to write this post as an attachment to my original review of the shade SX08, which you can read here. The sensual skin enhancer costs £38 for one pot and you get 0.63oz = 17.86g of product. It is expensive but when they say a little goes a long way, they really aren't kidding at with this stuff. I've been using SX08 since the end of 2014 frequently (maybe 2-3 times a week) and I've still not reached half way down the pot. So in terms of price, the initial cost is a bit of a splurge but actually you'll only have to repurchase every 2-4 years, provided it doesn't go off completely and so I think it's worth the money. Also each of my shades I purchased on some sort of sale, the first two I got when beautybay had a 20% off sale so they only cost me £30.40 which is a total bargain considering how much you get. Definitely recommend waiting for the end of year/black friday sales! The main reason why I wanted to do another dedicated post to these was because a lot of people have trouble with this product when they first purchase it and I hope this post will provide you some insight in how I make these work for me on a regular basis. The K.A Sensual skin enhancer is the most full coverage concealer product that I own - it is incredible and can hide a LOT. I have very dark circles, so I have to colour correct with a peachy tone and having a bright under-eye area is key for me. Maybe not for every single day, but whenever I'm going out for lunch or dinner, for a special occasion or if I want my makeup to look a little better that day, bright under-eye area makes the world of difference! Before I discovered this product it would take a lot of effort to achieve that bright under eye look and at least 4 different products. The beauty of the sensual skin enhancer means I only need to use a corrector on the darkest parts of my under-eye and then a layer of this blended out over the corrector and all over the area I want to be brightened is enough to achieve a flawless look! Firstly to ensure my whole face is well moisturised, because the better prepared your skin is, the greater it will adhere to the makeup. Take a little of the product on your ring finger and warm it up, so what I mean by that is pat the concealer between both your ring fingers. As the formula is so super duper creamy, I find it applies and blends so much quicker and easier when you warm it up first, versus applying it with a brush or straight from the pot. Gently pat the concealer in the inner-corner and downwards, then take the remaining product under the eye - BUT not directly under the lower lashline. If you over-load it in this area and have fine lines like I do, you are sure to get a lot of creasing straight away because the formula is extremly creamy. So leaving a little gap is the only way you'll avoid this. If I have more time on that day I'll start blending out the product with my ring finger, as the warmth of my finger does a really good job. If not I'll go straight in with a beauty blender and pat away until its all blended INTO the skin and looks beautifully flawless. I then straight away set under the eyes with a yellow powder, previously it was only the Kat Von D contour kit one (reviewed here), but these days I've been obsessed with a fantastic cheaper alternative here. and recently the step which has been making the whole look appear airbrushed, is the good ol' baking technique! Except I will never keep the powder on for too long, 30 seconds is enough. I tent to re-spritz my beauty blender before dipping it in a loose powder and then carefully press the sponge all over the under-eye area. This provides a layer of powder which literally works as a barrier against creasing. But remember 30 seconds, because I find that if I leave it on for longer, my under-eyes look very cakey and overly dry and awful. FINALLY this is a step I'll only do if I need my makeup to last for longer than 14 hours, I'll spritz my beauty blender with a makeup setting spray (currently loving the pixi beauty one) and then i'll push the sponge all over the area I've just baked. This acts as another layer of protection and in the heat/looooong makeup days it will ensure your concealer will stay put! So yes there are quite a few steps, some that I don't do on a daily basis, but it is well worth it for the finished result. Plus the fact that I only have to use two cream products (corrector and concealer), V several concealers means I actually save time and hassle! SX06: This was the second shade I purchased because I needed one for brightening and as far as the internet had told me, 07 was far too pink for my olive skin. 06 is VERY brightening and yellow in tone, so if your skin pulls more on the neutral side, this may be too intense for you. I rarely use this alone, the only time I would is if I'm going for the SUPER bright intense highlight look, which I have done for some special occasions. However if you're planning to use this on a regular basis, I think 06 would be the ideal concealing and brightening shade for you if you're Punjab in NARS or 21 in Dior. For quite a while I had been mixing this with 08 to create the perfect everyday brightening shade, which does work well don't get me wrong - but for the mornings when I don't have time to be sitting there creating my perfect blend (which is every morning now I'm in teacher training! ), it was too time consuming. SX07: Is the newest as you can see from the second photo, there is a tonne of product still which makes me really really happy! As I explained above, I didn't NEED a shade inbetween, but it would definitely be handy so when I saw another deal for 15% off I grabbed my chance and picked it up. Whilst online swatches and descriptions had led me to believe that this colour would be too pink, I did see someone on youtube, who has a slightly warmer complexion than I have use it - and it looked great on her. You can see in the swatch above that its not as yellow as 06, however for me this works perfectly for everyday as I don't always need to have such a bright shade for a daily basis. In fact I KNOW I shouldn't be going into school with a fully highlighted and chiseled face loool, so I definitely avoid 06 and I'm pleased to report 07 works really well! If you're stromboli in NARS or 31 in Dior this is the ideal brightening shade for you, which can be used as a concealer under the eye, or a cream highlighter on all areas you want to look brighter. SX08: Was the first shade I purchased and this is the shade that actually works to conceal redness, spots, blemishes, anything skin-coloured I used a tiny bit of this and the Lisa Eldridge spot concealer technique. Of course I'll only do this for a special occasion, ain't nobody got time for spot concealing on a daily basis! I will from time to time use this for a normal day, because like I said I don't need to have that over the top brightened look going on for an average day. However since purchasing 07, I haven't used this much. I will use 08 on my mum who is one shade deeper than me, and it works beautifully at concealing her under-eyes and providing a slight brightening effect too. So purchase this if you're Barcelona or the shade deeper in NARS - but I would recommend you to try and get to a counter first! I know it's not easy, but try to source out a counter because it IS an investment and I would hate for anyone to spend a lot of money on a shade they aren't happy with. Anyway this is the end of my review of one of my most favourite products of all time. If you don't go for full coverage products normally, or you already have a concealer you're happy with for the under-eyes you don't need to pick this up. 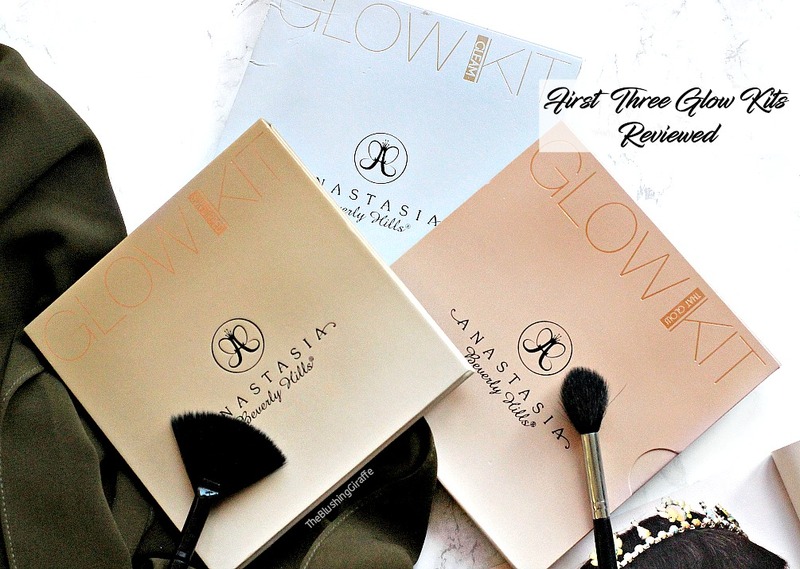 If however you're a fan of the super flawless under-eye and highlighting in general, I think you'll love this as much as I do! I genuinely cannot imagine my makeup routine without at least one of these and it is well worth the money because it lasts for a very long time. I don't envisage myself getting to the end of these pots for months and months to come. 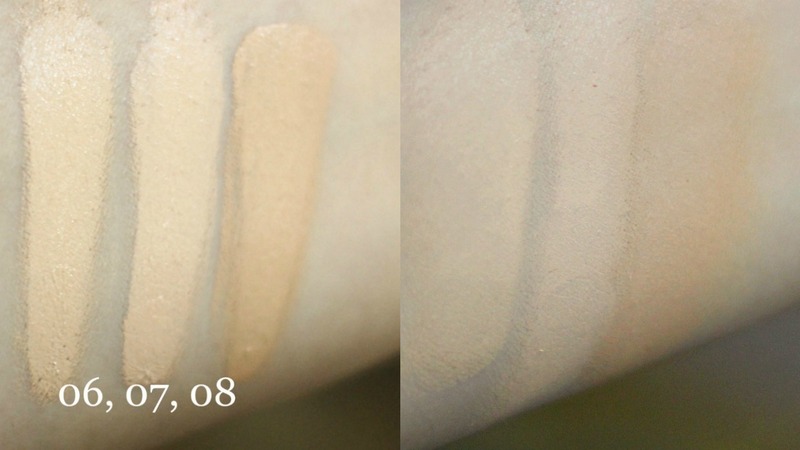 Do you have a HG product you love so much that you need more than one shade in?